I discovered the the Kohinoor sauces in my local Turkish supermarket, and I use them regularly in my cooking. 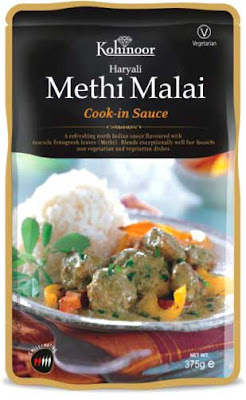 This Methi Malai cook-in sauce is one of my favourites. A rich creamy North Indian sauce flavoured with fenugreek leaves. Perfect for a hot lamb dish during fall. I have had a Turkish green grocer close by, and could indulge in fresh vegetables and intriguing new sauces and spices. I found this, and a few other varieties in the shelf, and fell immediately for the product. Now I am as happy. Since moving out of downtown Oslo, I am pleased to see that even Turkish grocers have found that living in the suburb is a good thing, and even doing business there. At Holmlia, there is a large immigrant population and, thank God, I found one butcher and one grocer, both Turkish (ish). And guess what I found at my grocers? Yes, you're right, the same Kohinoor products. That led to a Lamb casserole Methi Malai the other day. Remember to buy the cheaper cuts, as they will take the long cooking process. Here is what you'd need. Seal the meat on two batches in hot oil and lay aside on a large plate. Add garlic, onions, and peppers to the hot oil, and allow the vegetables to get slightly brown. Place meat on top, add Methi Malai sauce, and water. Stir to distribute liquid. Place lid on top and allow the mixture to simmer over low heat for 2 hours. After 2 hours, add beans and pour in coconut milk. Allow to cook for another 1/2 hour. IMPORTANT: DO NOT PLACE LID ON TOP AS THIS WILL MAKE COCONUT MILK SEPARATE. Serve Lamb Methi Malai hot with rice, and Nan-bread.